13|23. Coastal/Owl Forest. A cave leads to a potential breeding-ground for beholders. Eyes occasionally appear on plants and trees. 13|24. Coastal/Owl Forest. Selkies patrol the water against the intrusions of weresharks. They avoid the rotting Death Hulk from the Ghostmark War on the sea bottom. 14|13. Plains/Coastal. Villagers here never harm a nightingale on pain of exile or death. This is because the town’s ruler, Lady Szorka (female “human” bard 6, n), is secretly a hive mind of 96 alien nightingales from the far side of the gate in Hex 03|17. She used to be 101 nightingales, but has suffered casualties over the years. Szorka wants to replace her missing parts, but does not know how. She would ask the Stag of the Starry Heavens in Hex 04|16 but does not trust him. 14|14. Hill. DRUZMIRE ABBEY. 300 soldiers and 40 Cothic priests under Dovomex the Sanctified (elderly human male cleric 11, ne). Dovomex knows the truth about Coth and fears that the Cold Council of Lahaz will find out; he plans to replace Imperatrix Zulphine if she suspects the truth. Well-fortified and stocked for a seige; source of the Gray River. 14|15. Plains. Fallow Lahazi farmland. The manse of the long-dead sorceress Trovia is here, accessible by touching a graven stone in a pond guarded by a canny river-drake. Information in the manse points to the serpent in Hex 13|21. Among the manse’s treasures are a wand of acid arrow (40 charges), a wand of the teeth that assemble (22 charges), and bracers of the fated folly. 14|16. Coastal/Plains. The road follows the jagged coast southeast to northwest. A family of gnomes lives hidden on the cliffs among the squawking birds, below the road. They indiscrimately sacrifice people to a gull-faced aspect of Angsuma, hoping that one of them is “perfect”; this infuriates Veshara the mer-mutant in Hex 04|15, who takes a more scholastic approach to raising the Claw of the West. 14|17. Coastal/Istarion Agriculture. TOWN OF SHAR. The roads meet here in a town of 900 people. Ruled by Admio Truftan (old human male fighter 8, cn), a retired mercenary captain from the Baronies. Arrogant and independent, he dislikes the officious soldiers of the Remnant, but has a soft spot for their wizards. He is in love with Arlenn the Philosopher of the Lyceum in Hex 14|18 and tries to woo her (ineffectually) with tales of bravado and gifts of bad wine. 14|18. Coastal/Istarion Agriculture. ARCANE LYCEUM. An attempt to recapture the glories of the Old Realm on the banks of the Istarion River. Arlenn the Philosopher (middle-aged human female transmuter 8, ln) manages around 25 wizards (mostly transmuters of levels 1-3). She dislikes the garrison that Prince-General Voronos—the actual Remnant ruler—has stationed, but recently enjoyed a romance with the garrison leader, Captain Vanree. But the captain has disappeared, and no one knows that he was a death cultist who gave himself to the lich Dwar Ambrose in Hex 08|14. The Lyceum also contains a pedestal with the metallic lower body of a woman. If the metal statue from Hex 07|21 is placed there, it (along with the two other statues) will reveal the location of Muro Casmide’s Tomb (Hex 11|19). 14|19. Istarion Agriculture. Cultivated lands for the Remnant. A wolf with a mirror for a face (the result of one of the Lyceum’s experiments) hunts a small woodland, devouring reflections. 14|20. Owl Forest. FORT SULI. The Raining River (named for the aqueduct that begins in Hex 13|18 and that breaks apart here) divides into the Mernescart River (flows east) and the Ardescart River (flows southwest). They part around a tower-tree ruled by Lady Graine (adult female elf diviner 5/ranger 3/loremaster 2, cg). She commands 30 elves and owns the sun pearl, a powerful device for divination and illusion originally owned by Muro Casmide’s dragon, Thundering. Lady Graine has almost found the location of the item’s companion, the moon pearl, but while she can identify that it’s in Hex 07|18, she can learn no more and cannot spare people to find out. Elven tree roads lead east and southwest. 14|21. Coastal/Owl Forest. PORT CANNAI. The elven tree road leads east-west above the Mernescart River. Most of the east coast is impassable, but there is a small, semi-secret port cove here where elves trade with the outside world. 14|22. Coastal/Owl Forest. Winter home of the White Owl Elves. In the warmer months, maintained by stone statues and a few charmed human pirates. 14|23. Coastal/Owl Forest. Contains a forgotten escape route in case the White Owl Elves fell: passing through a circular hole in a certain tree takes one to Hex 21|19. It’s a one-way trip to a hidden cave containing a sailboat with an elven map and enough supplies (except food, which has rotted) to reach the mainland. 15|14. Coastal/Lahazi Agriculture. TOWN OF CRESH. Population 2,800. Basically part of Lahaz, except not as well purged of necrotic elements. Serious, recurring shadow problem, but the shadows are held at bay by zig-zags. Inhabited streets form harsh zig-zags; street designs feature triple-lightning-bolts. People wear zig-zagging spirals or starbursts on their clothes and mutter that they are more efficacious than Coth. Shipping here trades freely with Keimia but often refuses Olonto ships. 15|15: CITY OF LAHAZ. 22,300 people, but the city could hold many more. Former vampire city, then pirate base, gone semi-legitimate with semi-legal trade. Bisected by the Gray River. Ruled by the Cold Council (a squabbling aristocrat-guild-temple-tribe council who meet in a permanently-frigid catacomb) and headed by the not-as-easily-controlled-as-she-should-have-been Imperatrix Zulphine (adult human female sorcerer 4, cg). Zulphine distrusts the church of Coth and wants to improve relations with the elves and dwarves. 15|16. Coastal/Lahazi Agriculture. The road leads west to Lahaz and northeast around the coast. Called the Road of Hogs, as the ruined eastern extent was turned over to different clans who now squabble endlessly over who owns what pig. Branding is applied liberally to pig and person, to seal contracts or indicate payment, or for the satisfaction that comes from a well-delivered branding. 15|18. Coastal/Istarion Agriculture. The Remnant’s legions train and spar here, as if they believe Lahaz can see them. Their huge plume-banners are visible to ships. 15|19: FORTRESS-TOWN OF VALISONNE. A new fortress, as nothing of the Old Realm fortress remains. 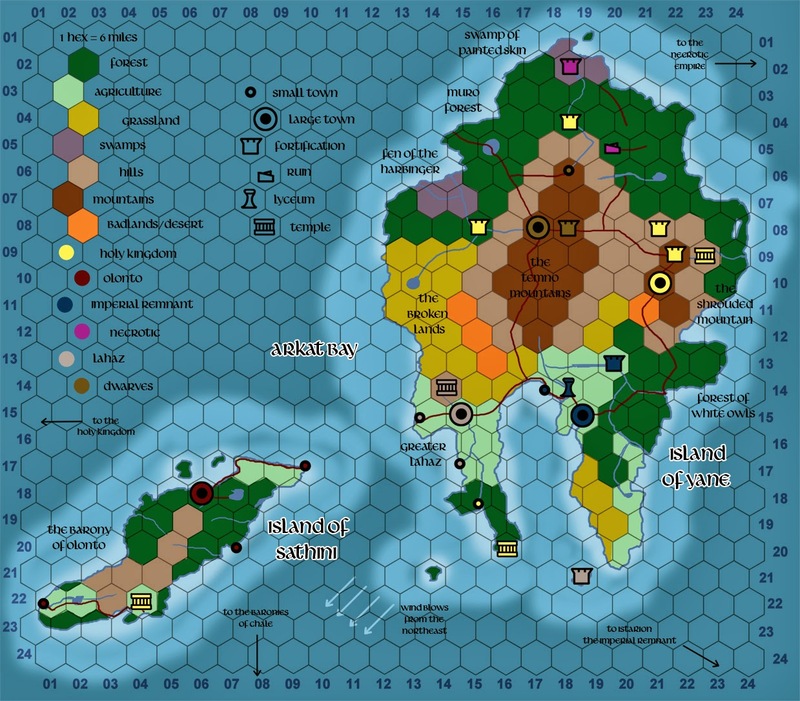 4,200 people ruled by Prince-General Voronos (middle-aged human male fighter 6, le), a ruthless and ambitious expansionist who dreams of becoming the next Emperor of Istarion…if he can just prove his worth. He has begun poaching battle-mages away from the Lyceum. 15|20. Owl Forest. An Old Realm road leads to a bridge that crosses the Ardescart river. Prince-General Voronos of the Remnant has petitioned the elves to yield part of their land to cultivation, but they have refused. An elf wizard waits in a grotto under the bridge, waiting to destroy it should Voronos order an advance. 15|21. Owl Forest. The White Owl Elves’ game preserve: a many-tiered woodland full of fat, tasty ducks with a laughably limited ability to fly. Ponds hold fish and the trees grow with apples and other fruit. The whole region is constantly patrolled. 15|22. Coastal/Owl Forest. Halfling explorers from the Kelder Vale have found themselves trapped by elf guard-automata. 16|13. Coastal/Lahazi Agriculture. Fishing villages. Villagers have captured a glowing angel of the god Tirwein that was sent to stop the freeing of the Claw of the West. It needs to reach Hex 14|16, but the villagers are depending on it for better fishing and will not let it go. 16|14. The seaside tomb of Eshi, a famous hero who fought alongside Muro Casmide. His tomb is guarded by the living screams of dragons and contains one of Trovia’s fangs (see Hexes 13|21 and 14|15) as well as a +2 shivering spear and a helm of the laconic knight. 16|15. Coastal/Lahazi Agriculture. The Gray River flows, mingles and divides here, forming agricultural tributaries. The villagers remember the local hero Eshi. Born to be vampire-foodstock, he found a serpent’s tooth that could kill nearly anything and used it to slay several undead monsters, including Alufen (killed in Hex 07|20). This is Trovia’s fang. The exact location of Eshi’s tomb has been lost. 16|16. Coastal/Lahazi Agriculture. A cruel blue-skinned cloud giant, cast out of the sky after a terrible battle, has enslaved a village by stealing their children. The village feeds him and brings him the materials he needs to return to the clouds and claim the Blue Sun Keep in Hex 07|23. But he asks too much food and someone will probably discover him before he can complete his returning-device. 16|18. Coastal/Istarion Agriculture. The landing-point of the cloud giant in Hex 16|16. The crater is tainted by thunder magic and children born to the villagers there have displayed strange sorcerous powers. 16|19. Coastal/Owl Forest. Elven “smithy” and “factory”: antelope with fine horns, ironwood trees, yaks with glossy hair (bowstrings), hard leaves for armor, and other elfy stuff like that. 16|20. Owl Forest. The Ardescart River divides into the Sirruth River (southeast) and the Frotha Lacha River (southwest). Huge, intoxicating (and dangerous to outsiders!) flowers mark the elves’ potion- and magic-ingredient-harvesting territories. Expect to be eaten by hostile plants, or impregnated by amorous ones. 16|21. Coastal/Owl Forest. The Forest Heart. The life force of the forest. Tied to the growing life in the northern forests; if destroyed, those forests will wither in hours. Guarded by Croian the Wise (female adult elf druid 10, ng), but she is frequently called away for other tasks. 17|06. Coastal/Sathini Forest. The treasure of Captain Zar the Cruel is buried on this little island. Zar buried thousands of gold pieces, as well as the cutlass of curs, a necklace of triumphant metempsychosis, a crown of the ruby sunrise, and a rod of the wheelmaster. Unfortunately, whoever finds the treasure, greedy dwarves will appear and claim that it is theirs due to baffling dwarven laws that make no sense to non-dwarves. 17|07. Coastal/Sathini Agriculture. Secret training camp for the Crooked Path Assassins, a group of Keimian fanatics exiled for their murderous policies. 15 assassins under Grandfather Waro (elderly male human rogue 5/assassin 8, ne). The Crooked Path currently considers abandoning its political ambitions to become a high-end assassination cartel, perhaps by aligning with Olonto. 17|08. Coastal/Sathini Agriculture. The road to Olonto hugs the coast and looks out on farmland. Ghosts from shipwrecks wander the wooded beaches. They will share the location of their shipwrecks so they can find peace. 17|10. Coastal/Sathini Agticulture. TOWN OF TRILIANA. 1,200 people under Lord Heroch (middle-aged human male aristocrat 8, ne), who married into aristocracy after amassing a shipping (and pirate) fortune. He fears that ghosts or oracles will reveal his crimes, and has necromancers and oracles put to death using his assassin and tailor, Andrio (adult human male rogue 5/assassin 2, ne), who is secretly a member of the Crooked Path from Hex 17|07. 17|15. Coastal/Lahazi Agriculture. TOWN OF ADOMASTAR. The farthest extent of the old undead city’s ruins. 1,000 people live beneath tall, empty gray columns covered in mouths. Lord Phune (elderly human aristocrat 5, n) rules. He believes the city itself is an undead entity that hates him; Dovomex the Sanctified in Hex 14|14 has used this fear to gain an ally against the Cold Council. The Little Gray River spills into the sea here. Trade is brisk and only moderately haunted. 17|16. Coastal/Lahazi Agriculture. Long-legged birds hunt through the marshes where the Gray River spills into the sea. A Crooked Path assassin from Hex 17|07 has learned to mimic their movements and appears invisible until he strikes. He practices on fishermen, not yet ready to offer his services for a fee. 17|19. Coastal/Southern Plains. Seven long-abandoned towers stand in the sea, connected by spiderwebs. Pirates have captured an enormous spider from the White Owl Forest, a favorite of the elf-children, and the elves want her back. 17|20. Owl Forest. The Frotha Lacha River flows north-south. An elf princess waits in a tower, supremely bored, watched by her avian tutor. The elves plan to use her to secure an alliance with a larger elven nation like the Banwood. She has Bara’s gift for controlling owls, and sends offers of rescue to “brave knights.” None have gotten close to the tower. 17|21. Coastal/Owl Forest. A shipwreck tangled in the huge roots. One passenger, a human sailor, is still alive, but an offended storm god that serves Angsuma caused the wreck and plans to hunt him into the woods. As always, you can follow along with the map here. 10|16. Mountains. Swarms of undead hands assemble into the forms of bears and maul travelers. They can be detected by the drone of swarming flies. 10|17. Mountains. The road from the dwarf capital to Lahaz runs north-south. A gnome merchant, unaware of her selkie ancestry, managed to reach her bathtub amidst her transformation and now gives uncertain orders to her automata, since her servants all fled. She has heard of the seal rookery in Hex 04|22 and believes that some magic there can help her. 10|18. Mountains. This region remains warm due to volcanic activity. It’s considered holy by the dwarves, who pop up out of holes to imbibe the sweet air through copper trumpets. In one grotto lie a half-dozen dead gnome servants from Hex 10|17 who fell off a cliff. 10|19. Hills. Boiling mud and tar pits. A fire devil lurks here, trapped in an ancient circle of holy oil that will not burn away. It has slowly called an army of goblins and elementals to its service and has corrupted the cultists in Hex 10|18, but still cannot escape. 10|20. Hills. A hidden domed village (a dozen buildings inside), covered by almost a foot of dust, scree, and verdure. Filled with carrion crawlers; the illithids who lived there are long dead, though some of their jade scrolls remain legible. Damage within resembles Old Realm magic. 10|21. Mountain. TOWN OF ZYFEN. 9,400 people. Keidian capital. Increasingly full of charlatan-clerics and sorcerers come to prey on the gullible. Ruled by Bishop Pholtan (middle-aged male human cleric 7, ng), a kindly but hapless miracle-worker surrounded by feckless swindlers. 10|22. Hills. Mossy hills lead to halfling burrows guarded by nature spirits. 10|23. Muro Forest. A huge automaton created by Old Realm magic to combat the undead. Apparently it failed. It still stands. Its marine payload died of starvation and haunts the automaton, but they lack the strength to animate it without the Forest Heart in Hex 16|21 or Zirkah’s Heart in Hex 13|14. Death cultists in a village nearby know about both of these and plot to steal one or the other. 11|13. Coastal/Plains. A savant (middle-aged human male cleric 5, n) lives here with his attendants. Trepanation opened his entire skull and now bees from Hex 12|22 have built their hive in his brain and granted him strange enlightenment and the power of prophecy. 11|14. Plains. A maimed warrior in a tent waits for death. He sought the immortality-granting heart in Hex 11|22 but was fatally gored. His wife knows that the warrior’s sons will kill her for letting him die, but no natural medicine will save him and the savant in Hex 11|13 refuses to intervene. 11|15. Badlands. Three pyramids formerly sacred to the Necrotic Empire were inhabited by orcs for decades until last year Lahaz and the dwarves burned them out and collapsed most of the tunnels. 11|16. Hills. Goblins riding giant floating jellyfish have begun to terrorize the region. They stole the technology from the domed village in Hex 10|20, but don’t understand that if the jellyfish ever meet the ones in Hex 9|13, the result will be a terrible hybridization. 11|17. Mountain. “The Five Wounds.” Created by the energy discharge of Nemiatron’s Spear, a lost Old Realm artifact, when an Old realm Wizard used it to annihilate the Elder Brain that once ruled beneath the dome of Hex 10|20. The geomancer Vulpery (old human male earth-wizard 6, n) has a hanging citadel near one of the holes and uses it to fuel his magic. He wants to learn more about the “roc” in Hex 12|17 and will pay for someone to investigate the nest. 11|18. Mountain. MOUNT KADATH, the remnants of a volcano. Below, craft-dwarves of clan Navuro work. Above, a cult of degenerate humans regularly sacrifices people to the volcano spirit. The craft-dwarves feel evil creeping into their creations but do not know why. 11|19. Hills. MURO CASMIDE’S TOMB. Hidden except by the magic of the Three Statues. Contains Muro’s weapons and other treasures, including a +2 lance of dragonstorms, +3 full plate of the Iconess, spurs of glass and gossamer, and the droning shield of Ish-Marault. 11|20. Plains. The druid Aillas (middle-aged male elf druid 9, n) prepares to sacrifice himself with an ivory dagger in order to become a mammoth god. His preparations are not complete and his acolytes are increasingly afraid. 11|21. Badlands. Something has exhausted the soil here. Unfamiliar metal pipes thrust up out of the ground to receive perpetual lightning-strikes. Despite the rain, nothing will grow. 11|22. Mountain. The highest peak of the Shrouded Mountain. The astral plane is accessible via a shimmering cloud guarded by the memories of Muro Casmide’s dragon, Thundering. 11|23. Coastal/Hills. Inaccessible by ship, though formerly a small port village. A labyrinth accidentally re-activated by Vulpery, now full of strange, hunting bull-like monsters that guard a mechanical heart that can grant immortality. 12|13. Coastal/Plains. A colossal bear has been spotted off the coast, large enough to crush a ship with one paw. 12|14. Plains. A circle of quartz stones can, at the right time of year, produce a reflection so clear that it clones a person. This clone is loyal to its creator, but vanishes after 1d6 months. 12|15. Badlands. The so-called Veiled Sage is in fact a headless victim of the ettin wizard in Hex 10|15. The orcs of the Broken Lands listen to its “wisdom,” but it only functions well enough to get the ettin more heads. It will claim that a “greater sage” in Hex 10|15 can heal, raise the dead, or almost anything else. 12|16. Hills. The dwarf-road travels north-south. A commune of grasshopper-people charges a toll to negotiate the jagged cliffs (with full approval of Queen Sarica of the dwarves). Dwarves who interact with the grasshopper people are convinced they’re talking to other dwarves. The grasshopper people offer troublemakers on a bloodstained stone as sacrifice to the “roc” in Hex 12|17. 12|17. Mountains. Freezing, beautiful source of the Modra River. A “roc” sighted in the area is actually a moonbird sacred to the druids of Yane. 12|18. Hills. Lahazi aristocrat-soldiers seek the fire devil in Hex 10|19. Their scheming cleric of Coth has told them to seek out and slay Scatha Sithu (Hex 10|18)—a bad idea. They know about the “roc” in Hex 12|17. 12|19. Plains. Giant-sized chariots have rusted over. Graffiti adorns their lower reaches. 12|20. White Owl Woods. The huge arm (and thyrsus) of the statue in Hex 07|13. The huge arm is inhabited by vicious wood-goblins who will fight to defend their home. 12|21. Hills. The road winds northwest-southeast. Obelisks once intended to enhance the flow of arcane power have been damaged by underground demons and now produce unhealthy magical reactions, spreading chaos magic and opening rifts. 12|22. Coastal/Hill/Owl Forest. The land is unapproachable from the sea due to cliffs and roots. Huge trees are full of equally huge bees. Several dwarf wizards led by Cabella the Geometer (middle-aged female dwarf universalist 6, ln) have organized themselves as the Cult of the Hexagon. Their experimental mind-expanding bees recently vanished (to Hex 11|13). 12|23. Coastal/Owl Forest. THE TREE OF RINGS. The massive tree here—visible from several nearby hexes—has its own gravity which points toward its trunk or one of its seven main branches. A few elves live here along with fey, were-creatures, and goblins. 13|14. Plains. An exile from the werewolves in Hex 03|18 has discovered a fanged heart. She does not know that it is the heart of the vampiress in Hex 08|23, or that it created the werewolves. She has gained strange powers from it. 13|15. Plains. The INN OF THE SHARP QUEEN. Part inn, part fort, frequently attacked, never taken, the farthest extent of Lahaz power. Run by Lady Coral (middle-aged female human ranger 7, cg), who is known to despise the Church of Coth. 13|16. Badlands. Orcmoot. Here orc summoners conjure the monstrous champions of different infernal gods to decide on policy. A clever goblin named Smarp has discovered how to influence the match through the use of the blade of the sword of Coth (which has earth and slow powers), which he took from Hex 08|14. Smarp has become wealthy and influential, and has begun looking around for assassins to kill his former partner, Braffi, who has the crown of Coth in Hex 13|19. 13|17. Plains. Ogres have taken to waylaying travelers on the north-south road. Their leader has a hand of glory that lets him walk through walls and that he renews with the blood and fat of humans. 13|18. Istarion Agriculture. The Modra River ends in a massive Old Realm aqueduct that heads east to hexes 13|19 and 13|20. Another river (the Istarion River), caused by damage to the aqueduct, winds south. Istaric guards patrol to prevent peasants from stealing building material from the aqueduct. 13|19. Istarion Agriculture. Bats cluster in the millions in the shadow of a massive east-west aqueduct. The goblin Braffi won the crown of Coth from Smarp (Hex 13|16) in a dice game. He now lives inside the underneath of the aqueduct, avoiding the water-wraiths that inhabit the aqueduct. He uses the crown of Coth to control the bats. He makes them steal from travelers, as the locals are superstitious of the shadow of the aqueduct. 13|20. Istarion Agriculture. GRAVARE CASTLE. The aqueduct that stretches from Hex 13|18 starts to break apart here, creating the Raining River below it, until eventually it falters completely beside the remnants of an Old Realm fort converted into a small castle. Lord Veyar (middle-aged male human fighter 7, n) commands 30 legionaries. The dwarves recently sent him an iron war-mask that they do not know is tainted with evil; it has begun to corrupt the men from its position above Veyar’s throne (he has yet to wear it for long). 13|21. Owl Forest. A cruel and ancient drake dwells here. Called Lyconis, it was once an Old Realm sorcerer whose experiments in immortality reduced him to this form. Lyconis can only die if stabbed with the fang of his mate, the sorceress Trovia, who died when she tried to cure Lyconis and instead took on his form. Trovia’s manse is in Hex 14|15, which contains the broken and inert remains of one fang. Her other fang was laid to rest with the hero Eshi, friend of Muro, in Hex 16|14. 13|22. Owl Forest. The road winds north-south. Statues and animated golems guard and teach the White Owl Elves’ few children. The (living) teacher there will tell characters about the lost elf girl (who is at Hex 18|18). It looks like I should have one or two more entries. The bad news is that it looks like my D&D game fell through, as people can't seem to get their schedules together. But I'm happy to finish these entries and then, perhaps, continue my work on Yane in the hopes of eventually getting another group together. Like last time, you can follow along with the map here. 06|20. Muro Forest. A broken bridge across the Nebulous River prevents access to the north (which leads to the remains of the Needle Tower). The ruined bridge features the Stone Statue of the Goddess Xarrion with her hand broken away. The hand is in the possession of one of the fallen paladins at Hex 04|18. If reattached, it and its three companion statues illuminates the resting-place of Muro Casmide in Hex 11|19. 06|21. Muro Forest. Lake of Clouds. The lake seems huge. It’s not very deep, and beneath it is a water-repelling dome and a mile-deep pit containing a fortress a wizard of the Old Realm created from the bodies of petrified giants. Hybrid experiments protect almost a half-dozen orbs and crystal balls of various functions and power levels. 06|22. Coastal/Muro Forest. Hidden rocks offshore causes shipwrecks. Pirates are aware of this and lay in wait. So do the locals, who will murder anyone who learns of their secret. 07|13. Coastal/Muro Forest. The enormous Wooden Statue of the Goddess Elicca, visible from one hex away, with an arm broken off. The arm (and thyrsus) is in Hex 12|20. If the arm is returned (difficult, as it’s as proportionately large as the statue), this statue (along with the statue in Hex 06|20 and Hex 07|21) can illuminate the tomb of Muro Casmide in Hex 11|19. 07|14. Fen of the Harbinger. A weed-choked serpent-people ruin. The hammer the serpent-people use to ring their gong is from the drowned Lake Scatho temple in Hex 05|16. 07|15. Fen of the Harbinger. A bridge of human and monkey bones over bubbling, necrotic filth. Monkey ghosts lurk in the filth, screaming blasphemies. 07|16. Muro Forest. Dwarves secretly work on a huge fallen meteor. Unknown to them, three mind flyers armed with a tesseract horn slumber in a central chamber. 07|17. Hills. The Old Realm road runs northwest/southwest here. Huge “termite mounds” are actually the underground cities of two races of diminutive (but larger than insect-sized) ant-people locked in a bitter war. 07|18. Mountains. Remnants of the silver dragon Antlers of the Moon, killed fighting Silani. A dwarf stole her silver treasures and now huddles—bejeweled, obsessed, and insane—in a nearby cave, commanding ragged orc slaves with the moon pearl, a scrying and emotion-control item. His treasure also includes a ring of star-wolves and a wand of spider-door (41 charges left). 07|19. Mountains. Undead vultures and bats in service to Nazor in Hex 06|18. They spy, steal, and may attack. 07|20. Hills. A road raised in the dead years winds generally north-south here. Simani’s vampire servant Alufen died on a hilltop nearby at Eshi’s hand. No one on the hilltop casts a reflection or a shadow. The Lumomancer Barcelemo established a manse here before Alufen’s crimson-stained spirit devoured him. Notes from Barcelemo’s manse lead to the Lyceum in Hex 14|18 and the mirror-faced wolf in Hex 14|19. The manse also contains a wand of color spray (50 charges left), a coruscant rod, and a startling number of vampiric monitor lizards. 07|21. Muro Forest. A one-armed metal statue of the goddess Amiza patrols a strange metallic woodland here, armed with sword and (strapped on) shield. She is also missing her legs, but someone has grafted a lower centaur body onto them. If brought to her pedestal in the Arcane Lyceum (Hex 14|17) and her arm and wand (owned by Yedric the Evoker in Hex 09|17) are returned, she will, with her sisters, point to the location of Muro’s tomb in Hex 11|19. 07|22. Muro Forest. A certain flower (known to the druid Senya in Hex 3|22) offers access to a miniature world with a few thousand inhabitants menaced by a tiny but cruel demon-god named Mahulo Shann. 07|23. Coastal/Muro Forest. BLUE SUN KEEP. A pearl-like fortress (created in the time of the Old Realm by the ancestor of the Cloud Giant stranded in Hex 16|16) floats far overhead or descends into the water on a regular circuit. It is usually hidden by clouds. No entrances are apparent. The runes in Hex 08|20 can reveal a hidden entrance. The fortress is overrun by enormous animals and contains increasingly unstable magical checker pieces of monstrous size (dangerous, but human-sized creatures can ride them to different areas of the fortress). 07|24. Coastal/Muro Forest. A huge hole in the ground contains a mostly-finished gate to Abaddon, full of dark filth and horrors at the bottom, but also treasure from Simani’s treasure-store: +2 plate mail of the nine desecrations, a scarab of hunger and thirst, a +1 heartstone dagger, and a hegemonic feather. 08|12. Coastal/Muro Forest. Tidal caves full of coral kobolds. They have mastered the art of growing weapons and tools. 08|13. Muro Forest. Abandoned copper mine, equally abandoned town, now a haunt of goblins, kobolds, orcs, and ogres. 08|15. Muro Forest. CASTLE MERNO. An imposing Keimian castle at the river-fork where the Pearl River divides into the Mother-of-Pearl (northern) and the Mirror River (southern), controlled by Lord Admuride (old male jotun fighter 8, ln), whom no one believes about the “Harbinger,” an aberrant lord whose mortal form dwells in a secret room in his castle. 08|16. Hills. The Pearl River bounces over rocks here. Dwarves come to an island in the Pearl River here to settle fatal disputes. The thick dwarf blood spilled here over centuries has formed wind-blown crystalline mounds the color of garnet. 08|17. Mountain. CITY OF METCHLA. Dwarf capital, population 8,500. Ruled by Metchla Saricca, Queen Under the Mountain (female adult dwarf aristocrat 5, ln). Dwarf quislings plot to sell out Metchla to the dead in exchange for concessions like wealth or immortality. The queen will pay dearly for the names of traitors and conspirators. 08|18. Mountain. The Mountain Trade Road stretches east-west here. The landscape is in the shape of a giant with a stone spear driven through his heart. The warlike Scatha clan keep a fortress run by Scatha Sithu(middle-aged dwarf male fighter 8, ln), who hates the Swindar clan and will use any excuse to move against them. He recently received a new ax from the dwarves of Mount Kadath (Hex 11|18); its fire dweomer is impressive, but it is an evil thing and wants to find someone more easily corrupted to serve it. 08|19. Hills. The east-west dwarf road splits off north here on a broken-apart dead-built road. Beneath the road lurks Dwar Ambrose, newborn lich and former headmaster of the Arcane Lyceum. He has designs on the horn in Hex 05|22 and also plans to raise a dead army to burrow up beneath the Scatha clan in Hex 08|18. He recently procured a death knight in the form of Captain Vanree from the Lyceum garrison in Hex 14|18. 08|20. Hills. Merchant caravans are common through here. The best caravanserai, the RAINING RING, is built around an ancient monolith around which air constantly churns. Studying the runes in the air nearby will reveal the location of Blue Sun Keep in Hex 07|31 and also a hidden service entrance of the Keep; the cloud giant in Hex 16|16 knows nothing of this method of access and would not be able to fit anyway. 08|21. Hills. HARANSHA CASTLE. Oppressed human peasants toil here serving Sir Tidan Hethmont (adult male human fighter 7, le), a dragon rider. They fear the wrath of his iron dragon Clarity (old female iron dragon). 08|22. Hills. The village here was recently razed due to necromancy, cannibalism, and human sacrifice. The villagers also murdered the cleric sent from Hex 09|23. A dozen soldiers from the Tower of Dawn’s Watch (Hex 09|22) hunt and kill the remaining cultists. 08|23. Muro Forest. The heartless vampiress Zirkah has defied the orders of the Necrarchs of Ahn Resh and established a small coven here in a ruined mill. She seeks ways to free the giant vampire in Hex 08|24. She has used a ritual to hide her heart, making her (even more) immortal, but she does not know that it has turned feral and created the werewolves in Hex 03|18. 08|24. Coastal/Muro Forest. A thin strip of woodland is really a colossal hawthorn spear driven into the heart of a giant vampire called Oschiron the Invincible. The treant in Hex 06|13 is supposed to check the hawthorn regularly, but he is trapped, and his dryads do not know what to do. 09|13. Coastal/Plains. Floating, glowing jellyfish serve to guide sailors through and around the dangerous rocks. 09|14. Plains. Wild bison and aurochs seasonally cross the Mirror River, where they are preyed upon by huge, shaggy river-cats. 09|15. Plains. The Mirror River runs east-west. Vachori the mad druid (adult male human druid 4, ne) along with a group of tribal humans, have recently butchered a halfling settlement; they plan to turn their wrath on the jellyfish in Hex 09|13 next. Vachori is an heir to the Old Realm and hid from the undead in suspended animation; his return to wakefulness has driven him mad and led him to purify the world. 09|16. Hills. The last mammoth on Yane makes its lair here, amidst the ivory of its dead companions. Nearby, a steep dropoff marks the old kill zone for these creatures. 09|17. Mountains. The road winds through the mountains north-south toward Lahaz. A hodge-podge tower is the lair of the geomancer Yedric the Crooked (old human male Evoker 9, n), who is cursed to fall into the moon. His tower contains rotating rooms, as his personal gravity always points toward the moon. (He rarely has guests.) Yedric also has a metal gauntlet that absorbs magic and a metal wand that functions as a rod of the safe herald. He does not know that these are part of the metal statue in Hex 07|21. The Hexagonal Cult of Hex 12|22 can remove Yedric’s curse, but every time he tries to contact them, he gets stung by a bee. If cured, Yedric will offer the metallic treasures as a reward. 09|18. Mountains. MOUNT VAISOK, the highest point in Yane. Almost impassable. Its peak features a massive shield-like bronze door covered in holy symbols meant to keep undead who attack from above out. 09|19. Mountains. Perpetually ice-shrouded switchback trails confuse navigation. Ice-aspected minotaurs wander the sky-labyrinths here. 09|20. Hills. A great east-west gate is here, and a bit of wall, and nothing else. It’s so tall it can be seen from adjacent hexes. What remains of the wall contains the faces of giants and monsters. 09|21. Hills. The road winds east up toward the Shrouded Mountain. Yak-folk and humans live in terraced villages. A field of sedge on one terrace can slice people and horses to pieces; the locals believe it’s sacred and do not speak of it. 09|22. TOWER OF DAWN’S WATCH. Castle ruled by Lord Seb Karune (adult human male paladin 5, lg) and his dragon, Eclipse (adult female gold dragon, lg). The other two Keimian dragons, Clarity and the currently-riderless Memory of Rain (Hex 04|19) also have roosts here. Seb Karune struggles to rein in his increasingly lazy and cruel knights. 09|23. Hills. The Bone River flows east down the hill. TEMPLE TO THE GREAT BEAR, a servant of the Iconess. The Great Bear is aware of Oschiron in Hex 06|13, but the cleric sent to investigate was murdered by cultists in Hex 08|22. 09|24. Coastal/Muro Forest. Spectacular waterfalls form a lagoon where pirates keep a secret trading outpost. Frustrated Keimian peasants help hide the outpost, where cargo, spices, and slaves can be purchased. 10|12. Coastal/Plains. This area is famous for a secretive herd of horses, nearly untamable and of superior quality. They can smell the undead but do not fear them. Vachori (now the mad druid in Hex 09|15) hid them (and himself) away under a lake (a trick he learned from Trovia, whose manse is in Hex 14|16) during the long years of undead rule. The horses know how to return to that place when frightened. 10|13. Plains. The Mirror River ends in the Leaping Lake, famous for its flying fish and diving birds. Tribal caste structures among the humans here limit who can take what prey; violations are dealt with harshly. 10|14. Plains. A battlefield of Lahaz soldiers and orcs. It’s not clear who got the worst of it. Goblins carry away what remains of value. 10|15. Hills. An ettin wizard dwells here, murdering everyone it can find and trying to bind a third head to itself using magic. It keeps brains alive in mi-go brain canisters borrowed from the ones found in Hex 01|19. The ettin has gauntlets of the piscolatrist and a basket of thundermites.